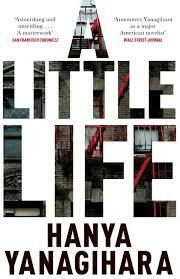 Booknotes: Hanya Yanagihara's A Little Life: an extraordinary, utterly absorbing, yet painful read. Hanya Yanagihara's A Little Life: an extraordinary, utterly absorbing, yet painful read. Normally I read all Booker shortlisted titles but this year that was a confronting challenge. A Little Life came highly recommended, with heaps of enthusiastic reviews, but it was 720 dense pages long. For the last two weeks however I've been completely absorbed in it, night and day. It's easily on a level with Ferrante when it comes to obsession. It's basically a novel of abuse, of trauma and incredible pain. It's viscerally powerful and confronting and at the same time exquisitely good. It's beautifully written in smooth and lucid prose, although off-putting at times in its lugubrious and dawdling style. It's frequently wordy and gets bogged down in too much detail which irritates - slabs of prose for dozens of pages without a break. (There is an unwritten protocol governing this sort of thing in fiction. Short chapters or frequent breaks are psychologically necessary. Yanagihara ignores this). Basically the novel is the story of Jude, a child abandoned at birth and brought up in an orphanage run by a religious order. We are all too familiar these days with what inevitably goes on in these dark and sinful places. The boy is good-looking and highly intelligent. Slowly, as the novel progresses on its meandering way through the lives and careers of his close friends from college onwards, Jude's awful story is revealed. Yanagihara teases, entices, diverts to other stories, but she never forgets, even hundreds of pages later, to tie up the loose ends. That is so satisfying. The book is an excellent portrayal of urban, professional, upper middle class US society, almost a sociological analysis of a privileged elite's social, economic and working lives - their country properties, their luscious apartments with expensive art adorning the walls, their constant holidays in foreign parts, their apartments in London and Rome, their theatre, opera and music, their so New York wealthy lifestyles. It's a celebration of deep friendship and love. But such care for Jude is never enough to bury, much less eliminate, his pain. I doubt there's been any character in literature who's been shown such love and support, but to no avail. Were his years with Willem, his loving and long-term partner, totally non-salvific? The author's intricate dissection of the rich and varied emotions at play in the Jude/Willem relationship is breathtaking. Jude is a cutter. He knows it's bad, but he's desperate to ease his interior pain, and the fact it causes him such grief, including serious infections, is a perversity he can do nothing about. Neither can Willem. It's just so tragic and sad. The novel has weaknesses, and some critics have have ripped into it for its 'sentimentality' and 'contrivance' (See Daniel Mendelsohn's controversial review in the New York Review of Books here). There are some really annoying tics in the writing. For example the main characters are constantly saying 'I'm sorry, I'm so sorry' to each other. Over a huge 720 page book which must have taken a long time to write one can forgive the author for not noticing this. But the editor? And the constant use of the expression 'off of' is annoying. However I did enjoy the narrative device of using a loose 'he' to deliberately destabilise the reader. It adds a surprising, intriguing and distancing edge to the narrative, seamlessly becoming a character's reflections rather than an authorial telling, and the reader is aware of being on uncertain ground. It verges on melodrama. They are all so clever, rich, handsome and successful. Even Jude, always in mental and physical pain, is one of New York's most brilliant and successful litigators. Nevertheless, all these little negatives are entirely tolerable in a story of such substance and power. I can enthusiastically recommend this book.